Shares of Apple (AAPL) are up 5.6% in late trading, after earnings per share for their fiscal second quarter came in nearly a dollar ahead of expectations. As was the case in the previous quarter, revenues came in not only a billion dollars higher than the street's average estimate, but a billion dollars higher than the street-high estimate...wow. With the stock around $200 and cash at $26 per share, Apple still trades at a modest forward Price-to-Earnings of 19. I say "modest," because I find that PE to be reasonable for a truly iconic brand that operates near perfection. As far as this stock has run, I'd say there's plenty more potential upside. That 4% PC market share is set to grow over the long-term, as Apple is not only increasing the quality of their offerings, but they're becoming more competitive on price. Free Cash Flow Yield(FCFY) is about 5.4% right now, after netting out cash from the company's market value. While not a "juicy" yield, it's better than other rapidly growing firms offer. Apple will likely continue surprising to the upside, making these Free Cash Flow estimates conservative. 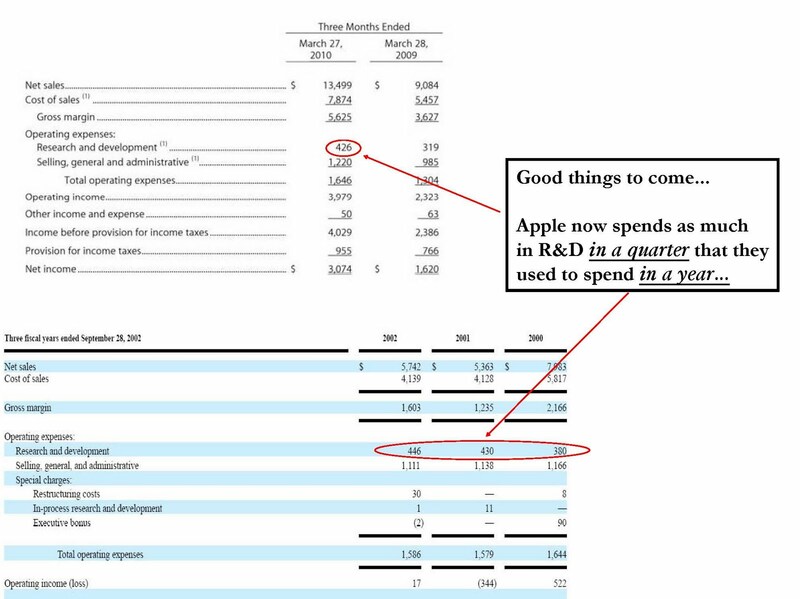 Add in the potential from new products, such as a new tablet reader that is rumored to be "shockingly" inexpensive, and there could be years of outperformance (vs the market) in Apple shares. I'd say the shares will easily hit the mid 200's this year, as it would imply a mid-teens multiple + cash balance. Using a 2010 estimate for Free Cash Flow Yield of 5% and adding in cash would get me to about $230 per share, but with upside potential from new products and the ever increasing desktop market share Apple is grabbing, this stock could command even better valuation levels. Apple gave its typically underwhelming guidance for the upcoming quarter. They're working at capacity in terms of iPad availability. In one odd exchange on the conference call, their CFO said "there is not a production problem" with the iPad. Yet they had to push off the international launch due to domestic sales demand....so...same thing, folks? The problem for me in valuing Apple is that the numbers are getting enormous. At the close of trading today, Apple's market value of $221billion was 32% higher than a little outfit called International Business Machines...IBM for short. But my complaining about the huge market value ignores the facts on the ground. The facts are that Apple will probably earn $14 per share this year, and has $25 per share in cash. In September of this year, Apple shares at 18x trailing earnings, plus cash on the balance sheet, would equal $277, or 8% above current levels. A Free Cash Flow Yield(FCFY) of 5% - what I consider fair for this company - implies nearly 30% upside. Either way, I still think shares will head much higher.